Commercial vehicle wraps are a great way to advertise your business! 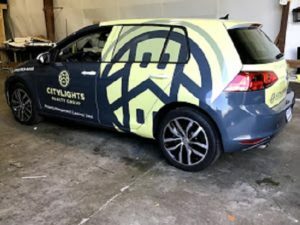 Vehicle wraps are a great way to customize your vehicle the way that you would like while also promoting your brand and business. Thousands of cars are on the road every single day, so wrapping your commercial vehicle is a great way to gain more business exposure. Here are the different types of commercial vehicle wraps. If you want to make the best and biggest impact, a full vehicle wrap is the way to go. This type of vehicle wrap covers the entire vehicle, making it easy to see and providing a large space to put your design on. Using every inch of space on your vehicle helps to make for an eye-catching vehicle wrap. If you want something smaller and more discreet for your commercial vehicle wraps, then a partial wrap is a good idea. The part(s) of the vehicle that you want to cover is completely up to you. Some people may choose to just wrap one side, while others may choose to just use one image to put on the vehicle. Fleet trucks already attract attention because they are significantly bigger than the average vehicle. Commercial vehicle wraps are great for these trucks because people have no choice but to pay attention to them. The challenge with fleet wraps is making sure all of the fleet trucks that belong to a company are wrapped exactly the same. These commercial vehicle wraps are especially important because a food truck is based out of their vehicle. This means that their truck is their business, so it has to stand out from the competition. Food trucks have to pay special attention to the design of their wrap because it is typically the look of the food truck that will either draw someone in or turn them away. Companies are taking a new approach to advertising by wrapping their company vehicles. Driving next to normal cars with simple paint jobs, these wrapped cars are bound to stand out and grab people’s attention. If you have multiple company vehicles, this is a great way to improve brand awareness and recognition. This entry was posted on Friday, September 28th, 2018 at 11:28 am. Both comments and pings are currently closed.